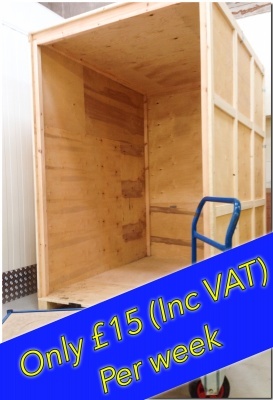 Crate storage is our most cost effective method of storing your belongings. You benefit from everything you would with our self storage units, such a 24/7 CCTV internal and externally and clean, dry storage for your belongings. The only difference is we ask for 24hrs notice prior to you needing excess to your storage crate. Our self storage crates are wooden warehouse crates which are kept safely in 1 of our warehouses. (Which you can see from the image to the right) We ask for 24hr notice so we can locate and place the crate in an area where you can easily access your belongings. What if I suddenly need access? Although we ask for 24hrs notice, we understand that this is not always the case and you may need access immediately. If this is the case there is a small fee to have access to your self storage crate. I'am worried about mold and damp? Absolutely not! All our self storage crates are A grade, clean and dry crates. They are also stored in our warehouse which is also a clean and dry environment. How big are your crates? Each storage crate is 250 cubic ft (2184 x 1574 x 2424mm). Which is the equivalent to about 37 sq ft if compare to our self storage units. I think I need more than 1 crate? Good news! We have multi crate discounts if you think you will need more than 1 storage crate. Give us a call to find out how much you can save. If you would like to book a self storage crate, have any question or would like to discuss your storage requirements further please give us a call on: 01761 23 23 59 or send us an email from HERE!